Mary Mallon was born in Ireland in 1869 and moved to the United States in probably 1884, if what she told her friends was true. Like many other Irish immigrants, she paid the bills as a domestic servant to wealthy families in New York. Eventually she discovered that cooking was her thing and settled into a nice career as a cook, which paid pretty well compared to other service positions. She was known in particular for her incredible peach ice cream. Between 1900 and 1907 Mary had worked 7 different jobs as a cook. Oddly, members of each household would come down with Typhoid shortly after her arrival. 22 people had become ill with Typhoid fever, including a young girl who died. Mary was perfectly healthy and she left each job for fear that she might contract the illness too. Nobody knows whether she suspected she had anything to do with its spread or if she, like everyone else, simply thought it was a coincidence. It wasn’t until Mary was hired by New York banker Charles Henry Warren that Mary was suspected of having any connection to the spread of typhoid. In 1906, Mr. Warren took his family to Oyster Bay, Long Island to stay in a summer home he had rented from his friend George Thompson. Mary Mallon was hired to be their cook for the summer. In August, Mr. Warren’s daughter was the first to come down with typhoid. Second was his wife, followed by 3 members of the staff and another daughter. 6 of the 11 people in the house had come down with typhoid. Three weeks later, Mary quit. Typhoid is a bacterial disease that is spread through contaminated food and water. The contamination usually came from feces, human feces. It can also be spread by insects feeding on infected feces, but that is far less common. At the turn of the 20th century, society had made great strides in general public sanitation and hygiene. Immunization against typhoid was not available until 1911 and antibiotic treatment wouldn’t be developed until 1948. According to the Center of Disease Control and Prevention (CDC), the chlorination of drinking water has contributed to the dramatic decrease in the spread of typhoid in the United States. Prevention is as simple as washing your hands after you use the toilet and always before handling food. In Mary’s time, 10%-30% of typhoid fever cases were fatal. Today, typhoid can be fatal, but generally only if it is left untreated. Only about 1% of patients with typhoid will die from the disease. It was well-known in 1906 that typhoid was only spread through contamination of food and water sources. The owners of the home were worried and knew they would have to investigate and find the source of the contamination before they could rent out the summer house to anyone else. Mr. and Mrs. Thompson hired investigators who found absolutely nothing within the house to explain the contamination. But it wasn’t until they hired George Soper, a sanitation engineer, that the investigation turned up anything useful. George suspected Mary, who as the cook, had had direct contact with the food. But since she hadn’t ever become ill with typhoid it seemed unlikely that she could be the source of its spread. However, after looking into her employment history he decided that her connection to each sudden outbreak of the disease was hardly a coincidence. But there was no way of knowing for sure until he had stool samples and blood tests. As it turned out, getting Mary’s cooperation proved to be a challenge. But George’s sense of duty to public health proved strong. He tracked Mary down again at her home, this time bringing a friend for support. She again resisted, yelled and swore at them as they beat a hasty retreat. He decided to instead give his research and reports to Hermann Biggs of the New York City Health Department. Mr. Biggs then sent over Dr. Josephine Baker and police officers to retrieve Mary. By now Mary was more than suspicious. She attacked Dr. Baker with a fork, who “recoiled on the policeman,” which caused confusion. In the confusion Mary was able to escape and eluded the authorities for 5 hours. When they did find her (thanks to a bit of Mary’s dress getting caught in a closet door), she continued to resist. Yelling, swearing, kicking and fighting, she would not listen to Dr. Baker or anyone else. According to Dr. Baker, there was nothing left to do but take her by force and get those stool samples with or without her permission. Mary was taken to Willard Parker Hospital where blood and stool samples were collected and tested. She tested positive for typhoid. It was determined that Mary was only a carrier of typhoid and never actually came down with the disease. But because of her contact with food and her somewhat lacking personal hygiene habits she was able to easily spread the disease to others. That year, over 3,000 New Yorkers had contracted typhoid and Mary was most likely the original source of the outbreak (NCBI: Annals of Gastroentorology). She was deemed a public health threat and sent to Riverside Hospital on North Brother Island and quarantined to a cottage there. 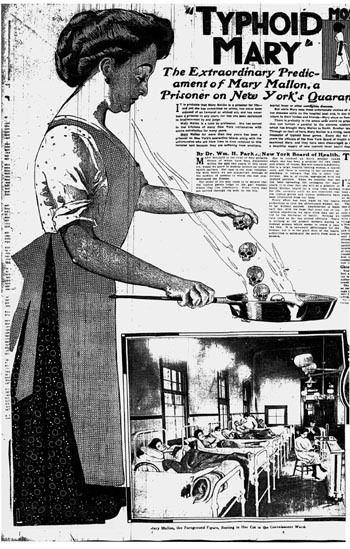 Two years later, in 1909, Mary Mallon attempted to sue the health department, which proved unsuccessful. She said she was being held unfairly. Mary didn’t really understand how she could be a carrier of a disease and never get ill and it seemed as if nobody at the hospital had explained it to her. However, she had been offered a surgery to remove her gallbladder (which might have cured her), which she declined. By 1910 the new health commissioner decided to let her go as long as she vowed to never work in food service again. She willingly accepted the conditions and was released from solitary quarantine. People were generally sympathetic to her plight and she was assisted in finding domestic work doing laundry. It was agreed by many that it was unethical to imprison a healthy person. In 1915 a sudden typhoid outbreak occurred at the Sloane Maternity Hospital in Manhattan. 25 people came down with typhoid and 2 of them died. All the evidence pointed to a new cook, a Mrs. Brown. Turns out, Mrs. Brown was actually Mrs. Mallon. Mary Mallon. Mary was recaptured and sent back to the cottage at Riverside Hospital. She lived there until her death 23 years later in 1938. During her time there it is said she became a nurse or a hospital helper, even working in the lab during the 1920’s. The fact that she had broken the agreement she had made with the health commissioner upon her release as well as used a false identity destroyed any sympathy the public had for her. At that point she had consciously put others at risk, whether she believed she was a typhoid carrier or not. She was directly responsible for at least 122 becoming ill with typhoid, including 5 dead. There is much controversy over Mary’s treatment by the state of New York, the Health Department, the media and the general public. She had broken no laws. There have been other people in the past who have been carriers of disease, some directly responsible for more deaths and illnesses than Mary was, and none were held in quarantine nearly as long. Some say she was targeted because she was an Irish woman or because she didn’t have a family. More than likely it had to do with the fact that she was employed as a domestic servant and refused to do domestic work that wasn’t cooking (which also meant she would be paid less). Her temper and refusal to accept the fact that she was a carrier certainly didn’t help her case. What do you think? Was Mary treated unfairly? Or did her threat to public safety and health override her personal liberty?